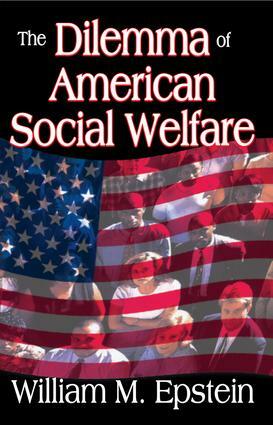 In the current political climate of the U.S., there are noeasily apparent solutions to the social problems we face.William M. Epstein claims that people in need have been poorly served and misled by the American system of social welfare. This is one of those rare works emanating from a social welfare expert that does not offer easy placebos or simplistic claims based on more money.The Dilemma of American Social Welfare argues against the idea that there are inexpensive cures for serious societal sicknesses. Epstein takes on an immense literature in psychotherapy, social work, and welfare, all offering simple answers to complex problems. Two of the largest social experiments ever undertaken in the U.S. are evaluated in depth. The Negative Income Tax experiments of the 1960s and early 1970s tested the feasibility of an income guarantee; and the Evaluation of State Work/Welfare Initiatives employed a variety of programs to stimulate welfare recipients to find jobs. Epstein also analyzes social services associated with social work and examines approaches to juvenile delinquency and drug addiction.Epstein is blunt in his denial that traditional welfare can readily resolve major social and economic questions of the times. His work, addressed to the malaise in thesocial welfare or helping professions, should serve asan early warning signal that easy solutions are hard for recipients to identify and harder still for donors to put forth. Although it was originally published in the early 1990s, the book remains relevant to political and social questions of the day, which makes it of interest to sociologists, political scientists, policymakers, researchers, and others interested in policy and urban studies.